On 14 high quality compact discs, Eric Martin narrates this popular non-dramatized version of the New American Bible New Testament on audio CD. This NAB translation is the achievement of some fifty biblical scholars. These Catholic scholars have approached more closely than ever before the sense of what the sacred authors actually wrote. From the original and oldest available texts of the sacred books, with a better understanding of Hebrew and Greek and the science of textual criticism, and with the fruits of patient study, these translators and editors have developed this contemporary version that is sure to respond to the need of the church in America today. The narrator, Eric Martin, has worked as a journalist, narrator, actor, writer, and radio broadcaster, and has received National and International honors in the field of narration. gold gilded edges and six ribbons. The missal is in both Latin and English. The English is on the left side of the page with the Latin translation on the right side of each page. 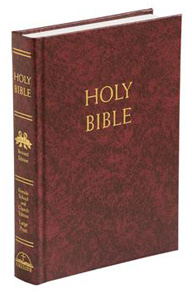 Traditional Catholic Spanish Bible - Translated from the Latin Vulgate. Spanish audio production La Historia Sagrada. Get close to God through the Word with these Bible passages of the Old and New Testament Scriptures as they come alive with music, drama, and the magnificent Spanish narration of Enrique Rocha. This is truly a fitting production of the Sacred History of the Christian faith as recorded on 24 CDs stored in a beautiful designed aluminum case for your enjoyment and safekeeping. This is Jerome's translation of the Greek and Hebrew Scriptures into Latin. It was recognized as authoritative during the Council of Trent (1546). It includes a Latin introduction, and expanded Apocrypha: Psalm 151, Epistle to the Laodiceans, 3 & 4 Esdras, and the Prayer of Manasses. Does Hollywood's "Kingdom of Heaven" tell the Truth About the Crusades? Life of St. Therese now on MP3-CD! Divine Intimacy - Father Gabriel of St Mary Magdalen, O.C.D. Divine Intimacy By: Fr. Gabriel of St. Mary Magdalen O.C.D. Traditional Roman Catholic and Charismatic Books. 1 Corinthians 1: 17-21, 25. For Christ sent me not to baptize, but to preach the gospel: not with wisdom of speech, lest the cross of Christ should be made void. For the word of the cross, to them indeed that perish, is foolishness; but to them who are saved, that is, to us, it is the power of God. For it is written: I will destroy the wisdom of the wise: and the prudence of the prudent I will reject. Where is the wise? Where is the scribe? Where is the disputer of this world? Hath not God made foolish the wisdom of this world? For seeing that in the wisdom of God the world by wisdom knew not God: it pleased God by the foolishness of preaching to save them that believe. For that which appeareth foolish of God, is wiser than men: and that which appeareth weakness of God, is stronger than men. "In vain you will build churches, give missions, found schools"
defensive weapon of a loyal and sincere Catholic Press..."
pectoral cross and soutane, in order to support a Catholic paper..."
During an audience for the general chapter of the Franciscan order in 1909, the pontiff appeared to enter a trance. Those present remained motionless and silent. After a few moments, Pius opened his eyes, rose from his seat, and cried, "What I have seen is terrifying! Will I be the one, or will it be a successor? What is certain is that the Pope will leave Rome and, in leaving the Vatican, he will have to pass over the dead bodies of his priests!" He then cautioned the witnesses, "Do not tell anyone this while I am alive." Just before his death, Pius had another vision. "I have seen one of my successors, of the same name, who was fleeing over the bodies of his brethren. He will take refuge in some hiding place; but after a brief respite, he will die a cruel death. Respect for God has disappeared from human hearts. They wish to efface even God's memory. This perversity is nothing less than the beginning of the last days of the world."